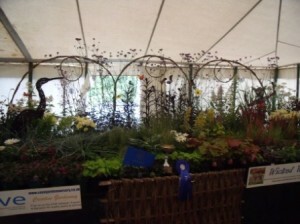 1st prize winners at the Mid Devon Show! We are very proud to say the Flower and Garden Marquee won first prize for its category and we didn’t know it was being judged till the day! Seeing as it was our first time there we are really encouraged and happy that our hard work paid off. Joolz and Woody worked like troopers throughout Friday and Saturday to help make the stand look awesome. 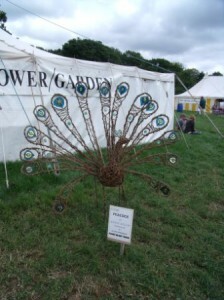 Joolz made the willow arch behind the back of the stand and of course the beautiful willow peacock with my glass feathers. Unfortunately she couldn’t be there on the day but Woody was a star assistant on the stand and also bravely gave a Willow demonstration to a captive audience! I should mention his willow Heron and Imp were part of our display too. The plants looked amazing although they never thought we would never get them all on the table! We would like to congratulate our fellow exhibitors, Tiverton Garden Club, Bampton Flower Arrangers and the florists Mayflower of Tiverton who had a lovely stand of flower arrangements, and all the others who were there. A special mention goes to Mary Tucker who with her organizing skills brought us all together and deserved to receive the cup. We met lots of great people this weekend…So heres to the next show but not till next year!